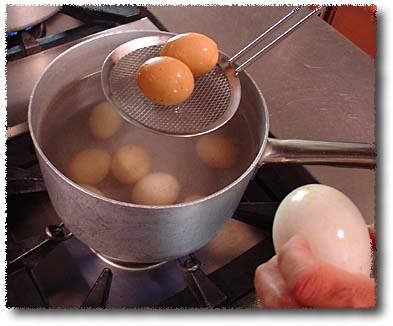 For perfectly boiled eggs, place them in a saucepan and cover them with cold water. There should be enough water to cover an inch above the eggs. Cook over medium heat until the water comes to a boil and then simmer for 3-4 minutes. Drain and plunge the eggs into cold water to stop the cooking process (you don’t want the whites to taste rubbery or the yolks to turn grey). Peel and cut into wedges. 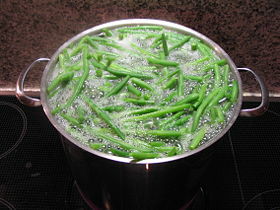 Next, you need to blanch the green beans. Prepare them by washing thoroughly and then snipping the tip off with a paring knife (the stem end tends to be very tough). Fill a saucepan with water and bring to a boil. Do not add salt as this will draw water out of the beans. At the same time, ready an ice bath with ice cubes and cold water. Drop the beans into the boiling water and let them cook for 2 minutes. Then drain with a slotting spoon and let them chill in the ice bowl for about 5 minutes. This will halt the cooking process and prevent them from turning soggy. 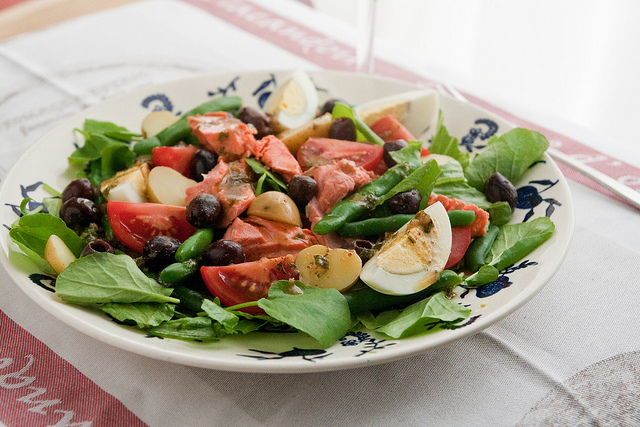 Arrange the salad leaves on two plates and add the tomato, artichoke, salmon, egg, green bean and cannellini beans. Top with the capers and olives. To make the dressing, put the ingredients together in a bowl or cup and whisk until blended. Season with salt and freshly ground black pepper. Drizzle over the salad and sprinkle with tarragon. Done! I’ll have to try this: you had me at “healthy” and I think I need to get into a bit of shape!